Track PMAY Application Status | Pradhan Mantri Awas Yojana Application Status August 2018 – Get all updates for PMAY, Process & tutorial. 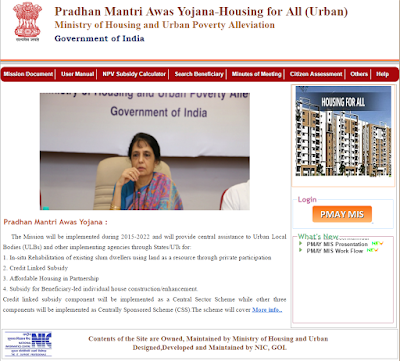 www.epfoscheme.in builds the step by step ways and direct links for you to use the feature of Tracking the Pradhan Mantri Awas Yojana Application Status through the official website. Get Updates on प्रधानमंत्री आवास योजना ✓ Important Dates ✓ Beneficiaries Details ✓ Flat Locations ✓ Annual Income Required for EWS/LIG ✓ Loan Procedure ✓ Application Form ✓ Interest Rate ✓ Loan ✓ Loan Procedure ✓ Flat Price ✓ EMI Calculator ✓ Number of Flats under PMAY ✓ Application Procedure ✓ Eligibility ✓ Subsidy Scheme ✓ Features & More. After applying for Pradhan Mantri Awas Yojana online through Common Service Centers ( CSC ), A receipt will be provided to the person called “Acknowledgement Receipt” along with the passport size photograph of the person & some kind of ********* application number. The Number provide by the Common Service Centers ( CSC ) can be used to check the status of your application through the official website. What If Application Number OR Acknowledgement Receipt is Misplaced? ► If its misplaced or damaged the person can also track their status using the name of applicant, father name of applicant & ID. ► First step should be open your browser and go to the official website. ► The link we provided will lead you directly to the main tracking page, as shown in the image down below. ► Choose your option as per your requirement OR needs. ► In the first option “By Name, Father’s Name & ID Type” there will be several blank space which you have to be fill, as shown in the image down below. ► After filling up the required fills hit “SHOW”. ► In the Second option “By Assessment ID” there will be a single black space which will ask you to fill your Assessment ID, as shown in the image down below. Previous articleHow To Double/Grow Your PF Money? Please let me know what to do after application. How to proceed for Home Loan. My home loan is under PMAY scheme but bank told me to need to wait for around 1 year once bank will received any subsidy from government that directly reflects in my loan is that true?? Subsidy will direct credit in your loan A/C. My home loan is under PMAY and bank was said within 6 months I will receive amount but its over 6 months but no any updates received. And bank not given me any Assessment ID. I purchase loan from ICICI Bank Under PMAY Scheme in Nov-2017. When i receive my subsidy payment from Govt. There is time limit for subject process….. I have done same process but it shows no record found..what to do now.. I have also faced the same problem. Dear Vaibhav I have same response. I am taking home loan from icici bank but there is no information from bank about subsidy.Bank is unable to provide any information about application status or assessments id.How to check the status of application.By name application status is not show. Dear Vaibhav, I have same response. Has anyone got the Subsidy ?